There’ll be a mascot race at Edgbaston this evening, to mark the first of the T20 games. Among those taking part will be a blue elephant, Coventry City’s Sky Blue Sam. According to an article1 on the Edgbaston website, the race is back by popular demand after the thrilling inaugural race last year. It’s not popular with everyone; there are some Coventry City supporters who are unhappy that their mascot will be taking part. They are unhappy because Warwickshire’s T20 team has been renamed Birmingham Bears. One letter2 says this “has left lots of Coventry City supporters who follow Warwickshire and lots of other supporters deeply offended.” Coventry City fans have had a lot to put up with this season, with their home games being played in Northampton. Now those who also support Warwickshire have had their team’s name changed to that of another city; it must feel like adding insult to injury. The reason for the name change is that Birmingham City Council requested it. The Mail described this request as “more akin to an offer they could not refuse”.3 The reason they couldn’t refuse was that money was involved; the council loaned the cricket club £20 million to rebuild the Pavilion End. The top tier of professional cricket may be set to go down the same route as the upper tiers of football in this country, where money is more important than tradition or supporters’ wishes. Birmingham City’s Beau Brummie and Belle will also be taking part in the mascot race today and I suppose I should wish them luck. But, despite his long history4 with the club, I find it hard to get enthused about Beau. A dog seems such a run-of-the-mill mascot. I quite liked the nose shaped mascot that we had for a short time; it was bizarre but that seemed somehow appropriate. To me, a nose running around on two legs was so awful it was rather appealing, rather like that Triton Showers paint splash kit from the 1992-93 season. In recent times we’ve had an ordinary mascot and a weird ownership situation. I’d like that to be reversed and have a weird mascot but a less weird ownership set up. This entry was posted in Birmingham City FC, Football and tagged Birmingham City F.C., Coventry City FC, Cricket, Football on May 23, 2014 by Puddleglum. 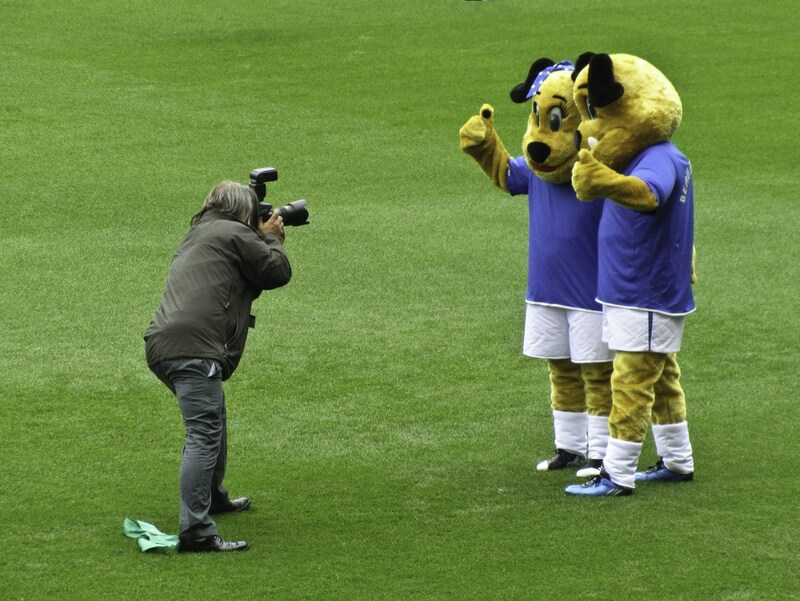 When I was a boy, I was mascot down the blues for a 3-1 victory against Norwich featuring Paul Tait and Ian Bennett. I saw the ‘Blue Nose’ take his nose off and was horrified to see a man with a moustache and a mullet. As a kid, that incident ruined mascots for me forever. The cricket was abandoned because the pitch was wet after the rain. I assume the mascots didn’t have their race either.